Perennial, ponds, passionflowers, Petoskey stones and more all in one tour. What more could you ask for? If you asked for bonsai, garden sculpture, roses and raised beds, then you would be getting closer to what you will find at the 2009 Gardens of Eden Garden Tour. What’s more, you won’t have to travel 100′s of miles to another state to experience this wonderful tour because it happens right here in the Monroe area. It’s coming up quick…this Saturday 11:00am ’til 5:00pm…rain or shine. Your ten dollar ticket goes to help charities in the Monroe area. Click here to find out the rest of the details. I suggest clicking on the link even if you think you’re not going, the photos of the gardens on the tour are great and I’m sure visiting the gardens in person will be very rewarding. Judy and I have been spending many, many hours each day in our gardens. May and early June are particularly busy for us. We do have help however. Every year we have to remind our helpers about Poison Ivy. Some learn very quickly how to identify it while others need a little more time. If you are spending any time at all outdoors, chances are you may encounter this plant. Poison Ivy is easy to spot once you know what to look for. The most noticeable characteristic is its three leaflets. Notice on the plant shown below how the three leaflets look. 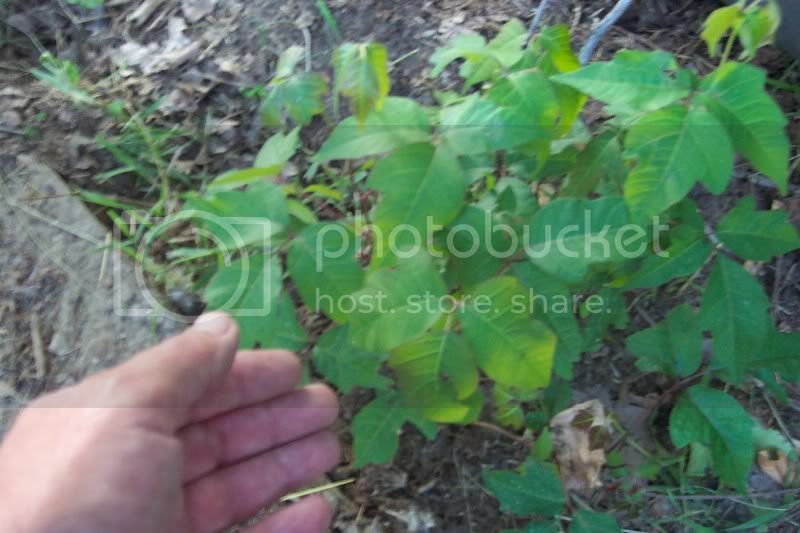 This is a Poison Ivy plant that has been cut back numerous times, it’s a little weak and the leaves are fairly small but still is recognizable. It almost looks like a small tree seedling. 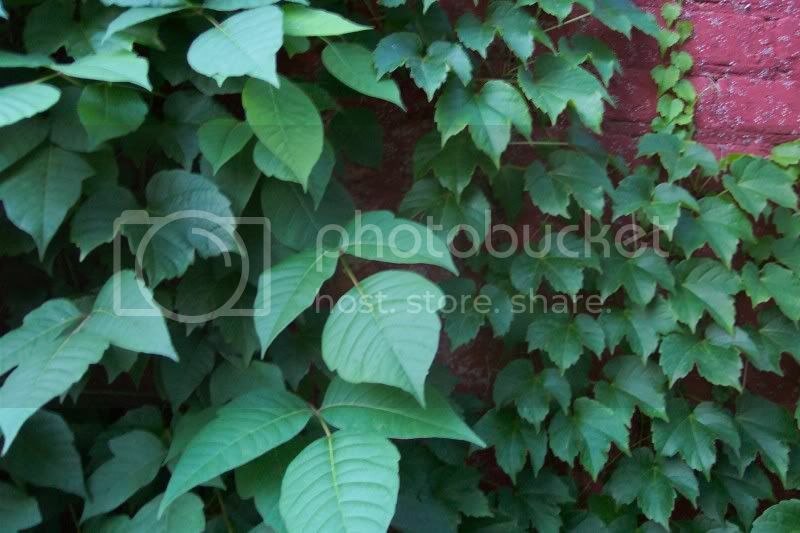 On this next photo we see Poison Ivy in its climbing form growing up the side of a building. The three leaflets are clearly noticeable. Also, notice how much larger they are. Now in this case, the owner of the building wanted a decorative vine to climb up the brick wall. He went to the nursery and picked out a very nice vine and planted it. So far so good. Unfortunately, as is often the case, a Poison Ivy plant has taken root right next to it and is over-growing the decorative vine. If you look close, to the right of the photo,you can see a vine with only a single leaf growing habit, that is the vine the owner planted and it’s not competing very well against the Poison Ivy. The owner insists that the Poison Ivy vine is the decorative vine he planted! Poison Ivy has the most beautiful red colored leaves in the fall. No wonder he can’t believe it’s Poison Ivy. There are other plants that have three leaflets, brambles such as wild raspberry are one example. Their leaves are fuzzy and the vines have thorns on them while Poison Ivy is smooth all over. So, enjoy the outdoors but watch out for Poison Ivy and remember that old saying…”leaflets three, let it be”.